Our deacons have assembled a helpful guide to point us to service opportunities and sort out the variables. Which are good for groups, or for including children? Can I go during the day, or can I help by performing tasks at home? Does it require a regular commitment or are the needs seasonal? Let’s help our friends fighting for homes to celebrate Christmas at Community of Hope’s Hope House! A small group of families will go to host the event, providing lunch, crafts, and decorating hope house of the season. Let’s all lend a hand by providing supplies and decorations! In the fall of 2011, a collaboration of pastors from a number of churches that make up the Church of North Portland, gathered for a conversation about how they could work together to serve the North Portland community, particularly those experiencing or on the verge of homelessness. 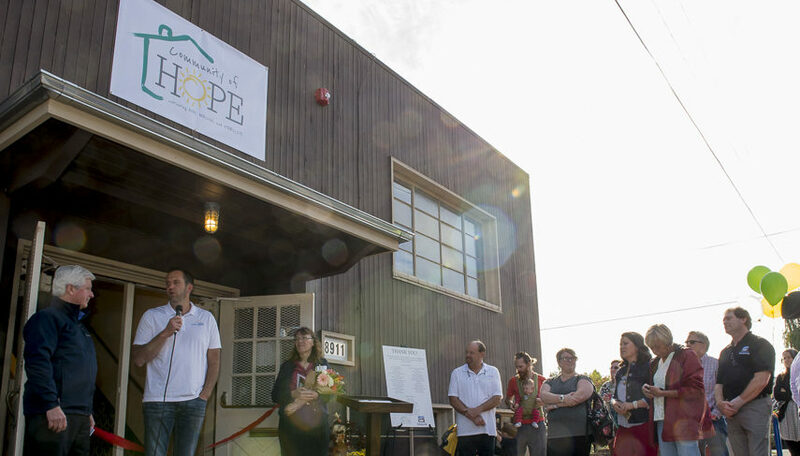 That conversation took root and now Community of Hope exists to empower homeless single-parent families to cultivate hope, healing, and stability while living in a safe, supportive environment. As we celebrate Advent this year, we have two ways to spend less time and money on ourselves and more energy giving to others. Click the image to download a packing list. PLEASE NOTE - ALL ITEMS MUST BE IN ORIGINAL PACKAGING, IN ORDER TO PASS THROUGH CUSTOMS. Packing on Dec 17 will (loosely) have 2 shifts from 4:30-6 and then 6-7:30 PM. You can click on the Flyer Image to download a PDF that includes the packing list. The supplies needed can be purchased for around $19 to fill an infant care kit, and $29 to fill a family kit. All items are easily purchased at local stores like Target & Fred Meyer. You can come ready to help pack, you can buy a kit or two or twelve's worth of items and either pack them yourself with us on Dec 17, or you can drop items off with Jamie Bash to be packed by others. Email Maureen or Jamie to let them know you plan to participate, and grab your friends, team up with your home group or Bible study, involve your kids, and get started!! Okay, "conspiracy" sounds a little more aggressive than this really is. Concerted efforts like this one are often branded "Advent Conspiracies," because we're plotting to exercise some restraint in the amount of money we spend on gifts for ourselves in order to show kindness to others. Fitting, since we spend Advent focusing on the incarnation of our Savior, who became poor, in order to make his riches ours. The Community of Hope needs to raise close to $60,000 to meet upcoming budget needs. So, they have asked churches like us to consider participating in a collections of small "conspiracies" around the city to set goals together and then work to give and help meet their needs. We would love to see if we can reach at least $1,000, but we'd rather set a goal as a congregation, and that requires some input from you. Talk and pray about this as a group of friends, a family, or as a small group, and then make a pledge a reasonable goal for your group below, so that we can set a collective goal as a congregation. This is only meant to be a way that we can hear from you to help us set our goals, with at least relative anonymity. Thank you for taking the time to think through and set a goal to participate! Good luck and have fun, and most importantly remember the goodness and beauty of Christ this Advent season! MISSIONS FUNDRAISER: NOVEMBER 14, 2015 "THE PIE MAN COMETH"
Don't miss this year's tastiest event!! In an effort to love and encourage our missionaries while they are far away during Christmas, the missions board is having a FUNdraiser! We are asking you to help us by making or purchasing any kind of pie or delicious pastry, or two, while you're kitchen is a mess anyways. Bring the delicious awesomeness with you to the event and then tell yourself, "Well done, Self! I've helped make a missionary feel very loved!" Once at the event you will see a plethora of pies and your senses will be screaming at you to taste as many as humanly possible. And we want to give you that opportunity! Simply buy a $1 ticket and you will get to try a sample. Or, better yet, buy a flight of pie samples, 7 for just $5. Hot or cold November-esque beverages will be sold to wisk that goodness down the gullet! Some of the pies will be sold as a whole pie which you can take home and freeze for the holidays! Music, hob-nobbing with your friends, an outdoor firepit, and let us not forget, PIE! By now you must surely be asking yourself, why wouldn't I go? And holy smokes, why wouldn't I invite others to join me? Hope has served with other churches at the Warm Springs Reservation in Central Oregon in 2013 and 2014, and we’re planning our third trip for this June. This is a great chance to serve, and the teams that have spent time on “The Rez” over the last many years have done good work. Because the history of outsiders working on reservations is long and checkered (at best), Sacred Road, the team with whom we partner, has spent many years mending relationships and building trust. They have worked hard to lay this groundwork, and our partnership requires sensitivity, humility, and a willingness to follow their lead. Attend initial training mid-April, and additional training once on The Rez. Raise $400 to cover their own cost up front. Leave & return with the team Saturday, June 13 & Saturday, June 20th.